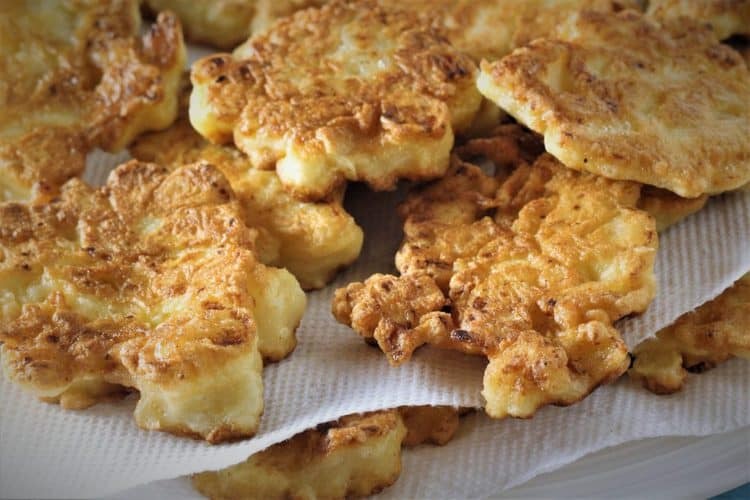 Another of my favourite foods that I’ve been eating my entire life are crispeddi cu brocculu, in Sicilian, or cauliflower fritters. 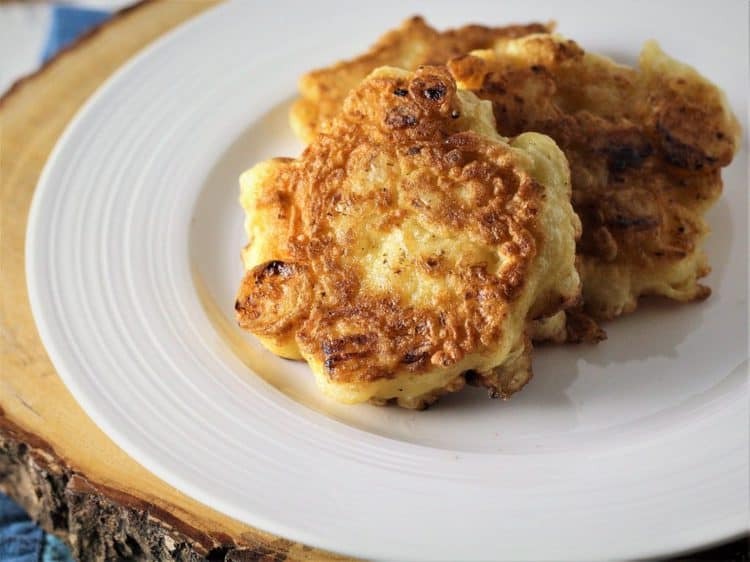 A simple dish usually eaten as a snack or appetizer, fritters are so incredibly easy to make and oh so underrated. 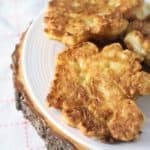 My mother has almost always made her fritters with cauliflower but there are endless variations to these. She recently told me that in Italy they often made them with greens such as swiss chard and probably other local greens. Apparently she used to make them with greens and we were not fond of them so she stopped. I can definitely imagine my younger pickier self objecting to anything with greens, or beans, or artichokes… I can go on and on. But with time (thankfully) I’ve learned to appreciate the simplicity of such dishes, both in their preparation and use of ingredients. Just last weekend we had a conversation about the recipes I’m documenting as well as those I teach in my cooking workshops whereby the focus is cooking with fresh, seasonal ingredients and avoiding processed foods. She took this opportunity to remind me about when I was a child and I would ask to stop by McDonald’s after my piano lesson (it was next door! ), how I’d beg for sugary cereals (because of the toy inside) or how I would ask her to buy me a frozen t.v. dinner (because of the curly fries). I simply wanted what we typically didn’t have at home. I also felt that many of her traditional recipes were boring or too healthy to possibly taste good! I’m going out on a limb here and I might get myself into trouble if my children read this and reproach me when they ask for sugary or salty processed foods which I absolutely refuse to buy. They are forbidden in my house. Maybe I’m being unrealistic when I hope that they will appreciate eating the real whole foods that I prepare for them at a younger age than I did, and they won’t turn around and rebel by buying microwavable dinners when they’re older! Who knows? But for now, I am doing my best to transmit these values to them. Which brings me back to these crispeddi! First of all, you must know that my children do love them. 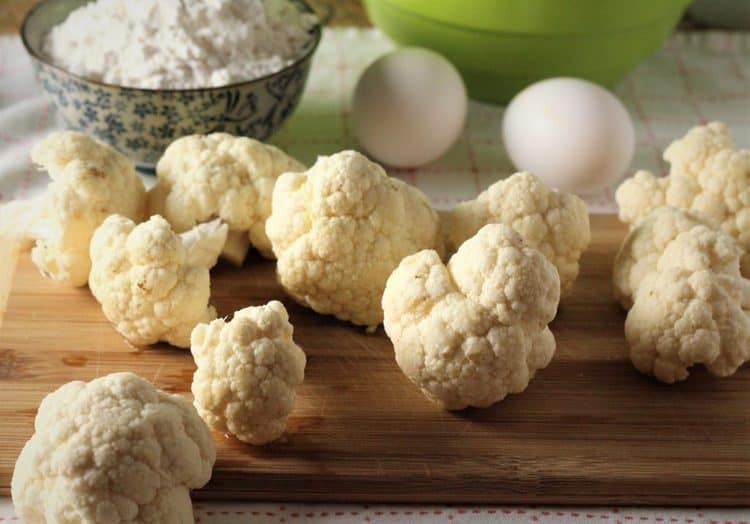 Although my daughter did ask me to chop up the cauliflower more finely so it is less detectable. Oh well! And I must share with you the other variation on these crispeddi which my mother particularly enjoys. 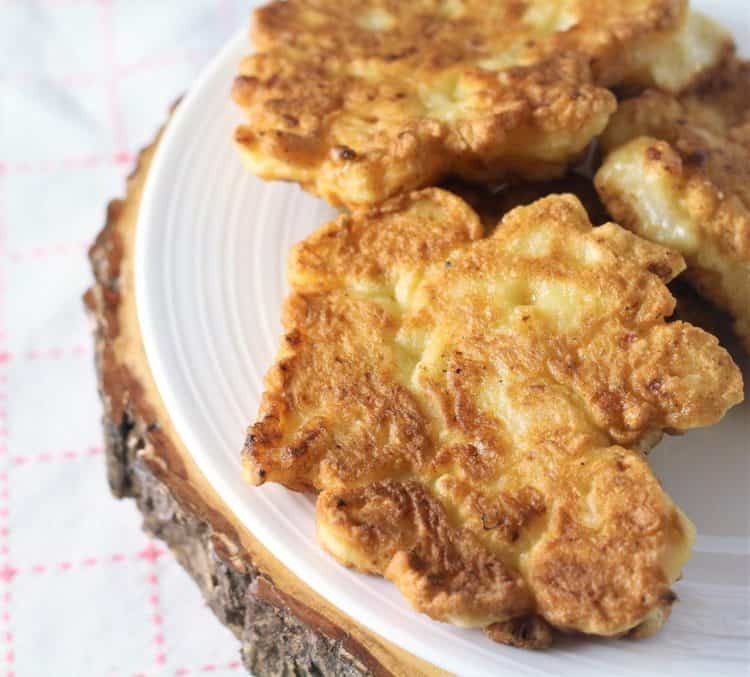 She makes some batter without any cauliflower, or any other vegetable, fries it up and then sprinkles a little sugar on top and enjoys it as a sweet treat! 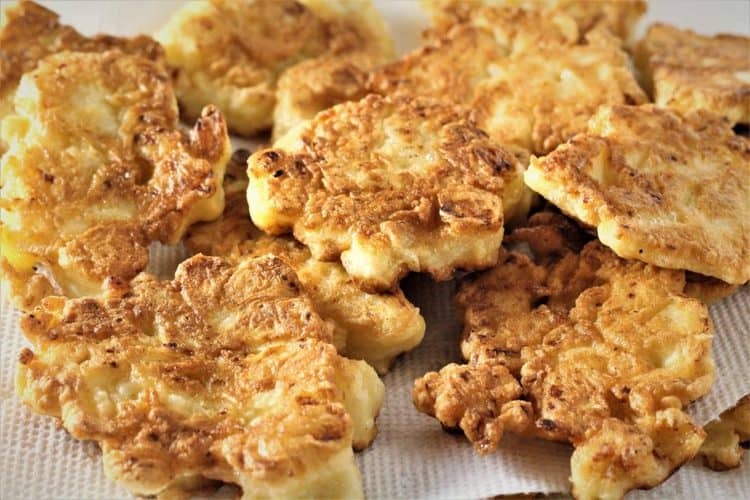 Cauliflower fritters or crispeddi cu brocculu, in Sicilian, are a great way to use up that fresh summer cauliflower. Serve them as an appetizer, side dish, or gobble them up as a snack! 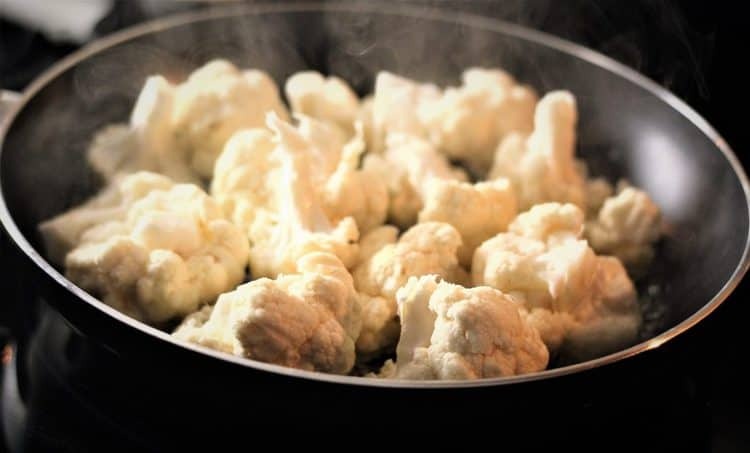 Separate the cauliflower florets and boil in lightly salted water or steam until tender, about 5-7 minutes. Cool slightly and chop into bite size chunks. In a large bowl, beat the eggs. Add the flour, baking powder, water and salt and stir until well combined. You are looking for the consistency of a pancake batter. Stir in the cauliflower chunks. Preheat a non-stick pan and add the oil. Add enough oil for a depth of about 1/2 centimetre. When the oil is hot, drop the batter by tablespoons into the pan. I fry six crispeddi at a time. You can place them close together as they will not stick together. 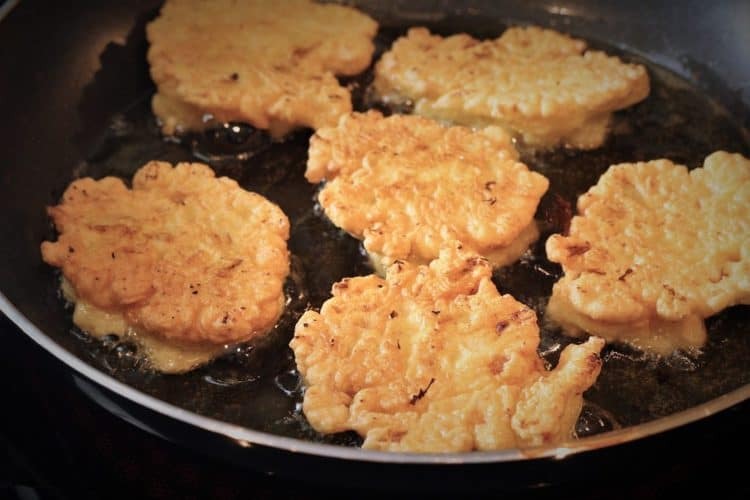 Fry until golden and crisp, turn and fry the other side, about 3 minutes per side. Transfer to a plate covered in paper towels to soak up excess oil. Serve immediately. Crispeddi can also be kept in the refrigerator and warmed in the oven before serving. How do they get flat like that? Hi Christina, I actually just spoon the mixture into the pan and don't flatten them at all. Some turn out more flat than others. Of course these are not leavened crispeddi so they don't puff up very much like the sfinci do. Thanks for your comment! Thank you Carly! That's what I love about these recipes, they can personalized according to taste. I'm so glad your kid likes them and thanks for taking the time to share this with me!